I finally found the recipe for the best chocolate chip cookies! Two years ago I found a recipe from The New York Times – at the time it seemed like every food blogger was writing about it: Brown-Eyed Baker, Averie Cooks, Recipe Girl, My Baking Addiction, The Cooking Actress, Two Peas and Their Pod were just a few – so, I pinned it. For two years I’ve been revisiting that recipe wondering if it could possibly live up to all the hype (or, in some cases, the non-hype). Could this recipe produce the chocolate chip cookies of my dreams? 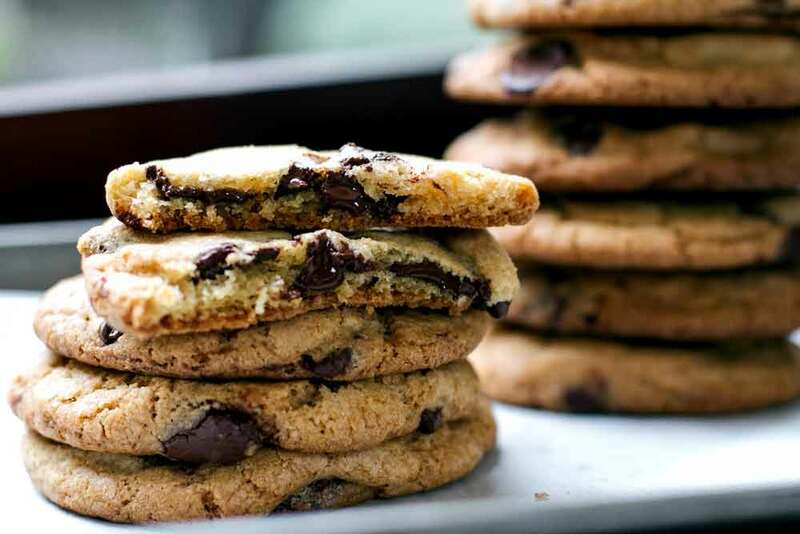 The New York Times chocolate chip cookie recipe (which, by the way, was adapted from a recipe made famous by famed chef Jacques Torres) is, in a word, awesome. 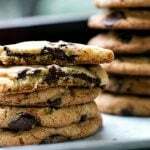 It produces a perfectly balanced cookie – crispy around the edges and soft and chewy in the middle with plenty of melty bittersweet chocolate throughout. The texture, the nutty and complex flavor, and the general appearance of these cookies make them a winner in my book. My search is over – this recipe is a keeper. It all starts with the dough. Both cake flour and bread flour are used – sounds like a hassle, I know, but both are important in achieving the perfect texture. Almost equal amounts of granulated sugar and brown sugar are used, which makes these cookies both crispy and chewy – plus the brown sugar brings that hint of molasses that gives the cookies a great depth of flavor. The batter comes together fast, but before you get to scooping and baking you need to let it chill – get ready for this – for 36 hours. This lengthy resting period enables the dough to fully absorb the butter and eggs. After 36 hours in the fridge the dough is dense and heavy (“like a brick” is how Steve described it), but a spoon and a little elbow grease is all you need to break it up so you can form it into golf-ball sized balls. The original recipe recommends scooping 3.5 ounces of dough for each ball, but I went a smaller size and eye-balled it. Which leads to another point – this recipe is not complicated and, in fact, is quite forgiving. True-blue bakers always use a scale to measure their ingredients, but I’m more of a non-scientific/lazy baker and never use a scale. Luckily, the original recipe lists the amounts both by weight and in cups and tablespoons. I didn’t use absolute precision and the final result still looked and tasted as the original recipe said it should. No, this recipe is not complicated and the only real challenge is waiting 36 hours to bake a batch – it’s tough, but they are so worth the wait. 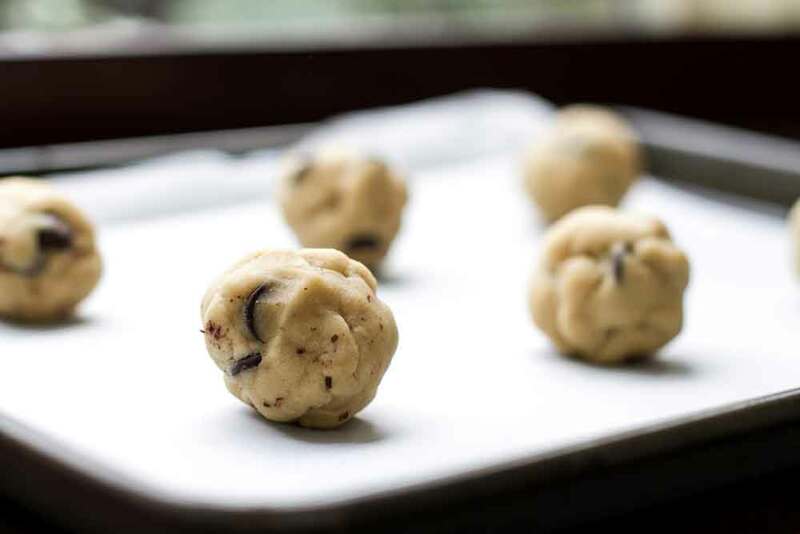 Oh, and here’s a fun fact – did you know that the original Toll House cookie recipe included a step to chill the dough overnight before baking? It was inadvertently left off the recipe when they started printing it on the back of the chocolate chip packages. So even Ruth Graves Wakefield, the chocolate chip cookie inventor, knew that the best dough is well-rested dough. The recipe calls for some fancy chocolate that you can order from Jacques Torres or buy at Whole Foods and, according to my research, both are totally worth the cost. However, I used Ghiradelli bittersweet chocolate chips (a 10.5-ounce bag) and I was completely happy. Ghiradelli makes some pretty good chocolate plus it’s readily available at my grocery store. So there you have it – my life is forever changed. These are the best chocolate chip cookies I’ve ever made. In a large bowl sift together the two flours, baking soda, baking powder and salt. Set aside. In a stand mixer using a paddle attachment, cream the butter with the two sugars until light and fluffy, about 5 minutes. Add the eggs one at a time until fully incorporated. Add the vanilla and continue mixing. Lower the speed on the mixer and slowly add the dry ingredients mixing just until combined. Once all of the dry ingredients are added pour in the chocolate chips and stir just until they are distributed throughout the batter. At this point you can either cover the batter with saran wrap in the bowl (make sure it’s touching the dough), or transfer the batter to a large zip lock bag (I didn’t have enough room in my fridge for my mixing bowl, so I used the bag, which worked great). Keep the dough in the fridge for at least 24 hours or up to 36 hours for best results. The batter will harden and get very heavy as it chills. Don’t be freaked out. Once the batter has chilled preheat the oven to 350 degrees. Using a spoon, break the batter apart so you can grab chunks of it to form into balls. You want each ball to be about the size of a golf ball. Line a standard sized baking sheet with parchment and evenly space six dough balls to bake at a time. The cookies need to bake for 18-20 minutes. I started checking on mine at the 15 minute mark — you’ll know they’re ready when they have started to brown around the edges, but are still soft in the middle (for me it was around the 16ish minute mark). Let them cool for a few minutes on the pan before transferring to a wire rack. One important note: These cookies are best straight out of the oven. After a day they start to lose their wonderfulness, so here’s what I recommend: Roll all of the balls and bake only the ones you want to eat that day. The rest of the dough balls can be frozen. That way you have the dough on hand ready to go when a chocolate chip craving hits. You will need to add an extra minute or two to the bake time if you use frozen dough. Or let the dough balls thaw on the counter for a bit before baking. Hi April, how I love chocolate chip cookies, actually I have heard of this recipe but never tried it, now I will and I will take your advice and freeze the dough balls. Love your photos. These cookies look amazing April! I love that you chill them for so long. I’m sure it helps the flavors develop. Can’t wait to try these! Now I have to go get some cake flour and bread flour…because these look amazing! 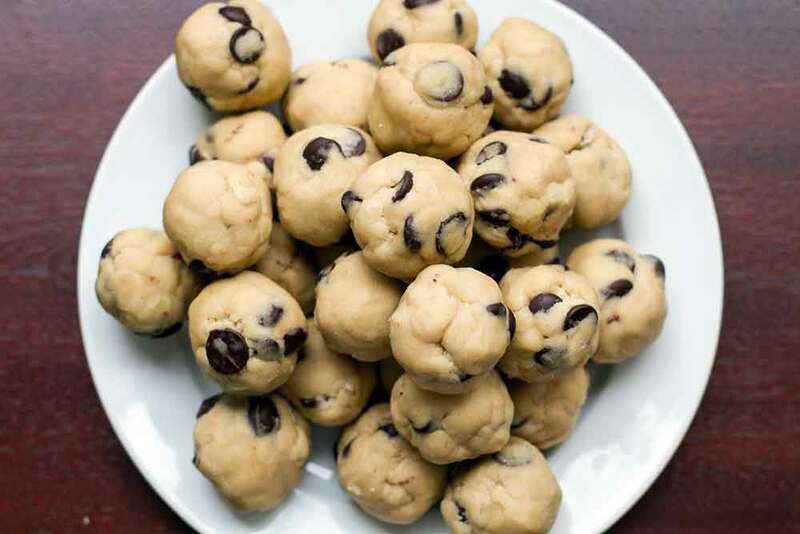 I don’t know if I could wait 36 hours and not sneak a few cookie dough balls, though….not possible! Gorgeous photos April. And I love this recipe!! They are totally my favorite too. 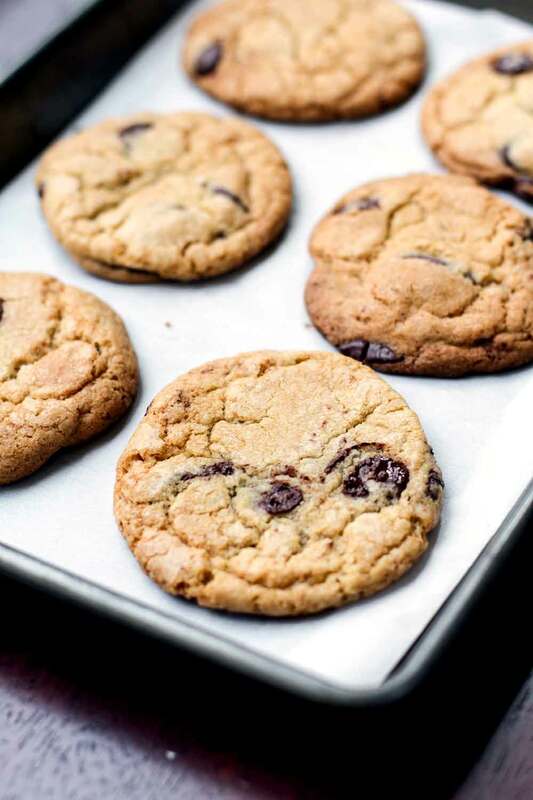 Though have you tried the Cook’s Illustrated “Perfect” Chocolate chip cookie recipe? The one with the browned butter? That’s the one I normally use when I just can’t wait 36 hours, but I use chunks instead of chips. I have also been on the “perfect chocolate chip cookie” train for many many years and I’m going to try these next. I love the last part of your post about freezing the balls so you can bake them anytime you want without having to start from scratch. Thanks for sharing this recipe, will get back to you with my results. Thanks so much for letting me know! I love the adjustments you made – especially the “more chocolate” part!